Ayatullah Murthadha Mutahhari, born on Feburary 2, 1920 in Fariman, near Mashhad, was one of the most versatile Islamic Scholars and prolific writers of recent times. He was deeply rooted in traditional learning and enamoured of its exponents. He was a thinker who had fully absorbed a rigorous philosophical training. His work is marked by a philosophical clarity that particularly qualified him to deal with the fundamental problem of religious thought that forms the subject-matter of this book. Ayatullah Mutahhari received his elementary education in theology from his father, Shaykh Muhammad Husayn in his home town, Fariman. When the Ayatullah was twelve years of age he joined the Educational Centre at Mashhad and pursued his studies there for five years. Then he proceeded to Qum, the great centre of Islamic Education. He stayed there for fifteen years and completed his education in Islamic Beliefs and Jurisprudence under the supervision of the renowned philosopher Allama Muhammad Husayn Tabatabai, Imam Khomeini and many other distinguished scholars. The particular school of philosophy to which Mutahhari adhered was that of Mulla Sadra which is a theosophy called ‘sublime philosophy’. Then he migrated to Tehran and started teaching philosophy and Islamic Ideology in Seminaries and later at Tehran University. During the period of his education the Ayatullah felt that the communists wanted to change the sacred religion of Islam and destroy its very spirit by mixing their atheistic views with the Islamic philosophy and interpreting the verses of the Qur’an in a materialistic manner. Of course, communism was the only thing which received Ayatullah’s attention. He also wrote an exegesis of the Qur’an, philosophy, ethics, sociology, history and many other subjects. In all his writings the real object he had in view was to give replies to the objections raised by others against Islam, to point out the shortcomings of other schools of thought and to manifest the greatness of Islam. 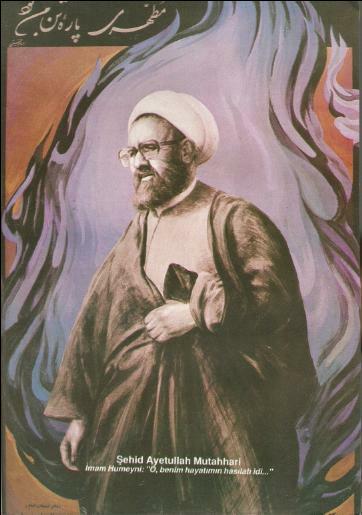 Ayatullah Mutahhari wrote assiduously and continuously from his student days right up to 1979, the year of his assassination. Much of his work had been published in and outside of Iran. He has written a number of books not in accordance with his personal interest or predilection but with his perception of its need. Wherever a book was lacking in some vital topic of contemporary Islamic interest Mutahhari sought to supply it. Ayatullah Mutahhari is one of two or three great contemporary Islamic thinkers of Iran. When the Islamic Revolution of Iran triumphed in 1978, Mutahhari was made Chairman of the Revolutionary Council. The activities of the Ayatullah were intolerable for the followers of the atheistic schools and they, therefore, decided to remove him from the scene by terroristic methods. Eventually they succeeded on the 1st of May, 1979. He was shot in the street by an assassin after a meeting of the Revolutionary Council. His martyrdom was a great tragedy. In his condolence message, Imam Khomeini said: “In him I have lost a dear son. I am mourning the death of one who was the fruition of my life.” Over a million Muslims escorted his funeral. He is laid to rest in Qum in the precincts of the Holy Shrine of Bibi Ma’suma.